Sculptor John Wenner’s high-pivot design stands to disrupt the cycling industry—but his innovative thinking all stems from a punk-rock, fun-first mindset. John Wenner is riding in circles in his driveway, and he’s smiling ear to ear. The laps are just the kind of exuberant loops that a 12-year-old kid with his first real bike would do. He spins circles of joy with just enough speed to generate a few G-forces—fast enough that a bit of gravel could send him down hard to the pavement for a quick and violent reminder that riding a bike can be serious stuff. But Wenner, 44, doesn’t care. He keeps looping round and round, each lap a bit faster, the angle a bit tighter, that smile growing ever-larger. The bike Wenner rides is his own creation. That’s why he trusts it. This particular collection of materials is a true extension of his body. The blueprint began in his brain. He fashioned the frame with his own hands. He painted it—colorful in faded black, yellow and red—in his garage. A true work of art, it’s a townie workhorse in chrome. And Wenner, whose revolutionary bike designs could disrupt the entire sport, keeps riding it in circle after circle. A lot of things make John Wenner smile. Most of them have to do with bikes, of course, but welding and beer also top of his joy list. A former full-time visual artist who still creates beautifully welded sculptures in his spare time, Wenner was first drawn to bicycle fabrication, the process of welding parts together to build the frame, through his work beating on metal to create beautiful things. In addition to being an artist, Wenner was also a cyclist, a biker who was part of a budding and underground scene taking place in the backwoods of Illinois during the 1990’s. 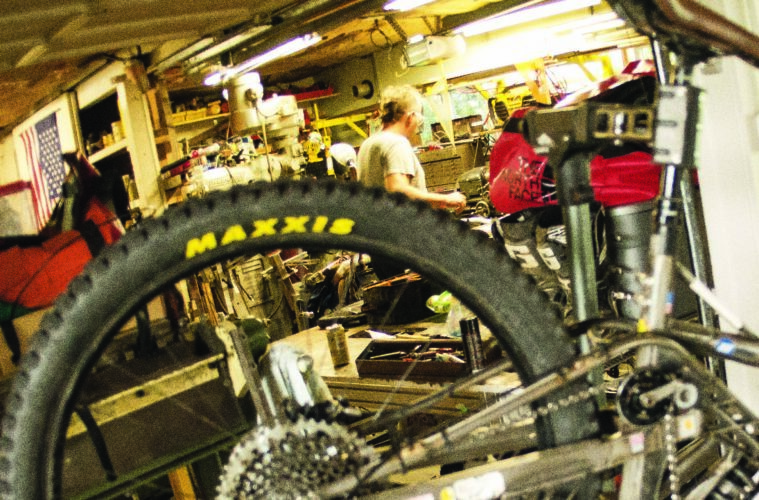 Wenner and his crew organzied some of the first—if not the first— enduro-style races in the Midwest. The DIY ethos of those early bike events was heavily influenced by punk rock and skateboarding, with the event flyers produced by Wenner hand-written and photo copied for distribution to a select audience with promises of FUN and BEER and FOOD. Enduro events—downhill-oriented competitions where riders were only timed on the downhill section of courses, with no time penalties for loading your bike in a truck and taking it to the top or walking it up or even sometimes riding it slowly to the top—were a perfect fit for the organic and carefree scene that Wenner embraced. “I just thought it would be fun to have a staged, timed race and drink a bunch of beers,” recalls Wenner. Another random event galvanized what was beginning to brew with that conversation. Before long, a chance meeting with two mechanical engineers at a beer festival led to a plan for a collaborative bike-building effort. Wenner’s unique “high-pivot” design was born. They may feel good, but, for those who haven’t tried them, Wenner’s bikes look strange. The beefy rear triangle looks overbuilt on first inspection and the wild chain routing is just bizarre. It’s the kind of bike a kid might design while doodling the hours away during math lectures in elementary school, but it’s a system that has attracted the attention of serious riders and industry stalwarts alike. The high pivot-suspension is certainly odd, but it’s efficient, providing that perfect balance of stiff on the ups and stable on the downs that mountain bikers covet. “Some people don’t like it,” admits Wenner. But the reality is that most people who experience Wenner’s custom high-pivot system do like it, particularly in the fast-growing enduro segment of the market, a segment that has the potential to revitalize competitive and recreational mountain biking. And with partnerships that include SRAM and Rockshocks it seems that the industry is paying attention to Wenner, even if his name remains obscure. Fat Bike Bliss Over the Mountain There Are More Mountains The November Issue is LIVE!